NodePing is designed to be as easy to use as possible without sacrificing on the capabilities you need. You can get quick results by just setting up some checks and watch the results start coming in. 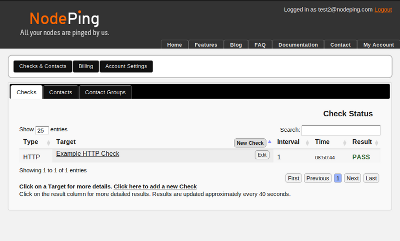 Each check causes the service to connect to some web site or service on the Internet and report on whether or not it was able to do so. So, getting started is as easy as clicking on "Click here to add a new Check," picking HTTP on the check type, entering a web site address in the URL field, and clicking "Save." Click on "Click here to add a new Check" or the "New Check" button to add a check. Click on the link under Target to get more information about the check. Click on the Edit button next to the link to edit the check's settings. More detailed information is available in the Managing Checks page. Quite often, though, you want to set up notifications right out of the gate as well. When you sign up, a contact is created for the email you signed up with. You can immediately assign that address to receive notifications from the service. Typically you'll want to add some additional contacts before you add too many checks. To add a contact, click on the Contact tab, then click on "Click here to add a new Contact". Fill in the name and email address or phone number (or both) of the new contact, and click Save. More information is available on the Managing Contacts page.